What is the city? Is it a space, a place, a process, or practice? Is it actual or virtual? How do we demarcate the spatial and temporal limits of the city? How does the city become a unit of social space and experience? How does such a unit register both social contiguity and tension in spatial terms and recast relations of gender, class, race, and other power configurations such as the global and local? How are the changing experience of the city perceived and mediated through film and other media? How do media technologies and their aesthetic articulations create and occupy actual and virtual spaces of the city and contribute to its demise and transformations? 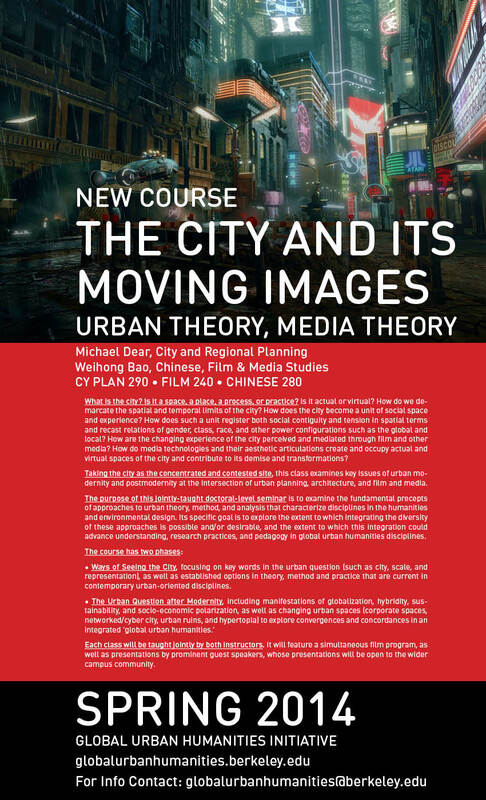 Taking the city as the concentrated and contested site, this class examines key issues of urban modernity and postmodernity at the intersection of urban planning, architecture, and film and media. The purpose of this jointly-taught doctoral-level seminar is to examine the fundamental precepts of approaches to urban theory, method, and analysis that characterize disciplines in the humanities and environmental design. Its specific goal is to explore the extent to which integrating the diversity of these approaches is possible and/or desirable, and the extent to which this integration could advance understanding, research practices, and pedagogy in global urban humanities disciplines. Ways of Seeing the City, focusing on key words in the urban question (such as city, scale, and representation), as well as established options in theory, method and practice that are current in contemporary urban-oriented disciplines. Each class will be taught jointly by both instructors. It will feature a simultaneous film program, as well as presentations by prominent guest speakers, whose presentations will be open to the wider campus community.